Windows 10 uses Edge as the default web browser. Microsoft's veteran web browser Internet Explorer might be hidden on the first look, but it comes pre-loaded with Windows 10. The most important reason for this is to support the legacy applications. 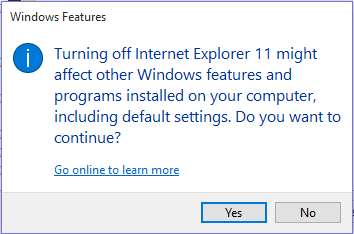 If you think it won't hurt to have Internet Explorer 11, think again. The security issues in the browser can wreak havoc on your system by taking advantage of sneaky techniques. A new security vulnerability about .MHT files (web archive file which contains html files and images, etc. that allows saving a web page completely) is a good example of this. A new security issue lets hackers steal your files, by just making you open a malicious .MHT file. In this case, the best solution is to disable Internet Explorer or to open .MHT files with an alternative program such as Vivaldi. We've explained below how to disable Internet Explorer 11 on Windows 10. Open the Start Menu and search for "Turn Windows features on or off." Alternatively: Go to Control Panel > Programs > Turn Windows features on or off. In the drop-down list, locate Internet Explorer 11 and clear its checkbox. Answer yes to the prompt. Click OK. The uninstall process may take a few minutes. That's all, .mht files will not be opened with Internet Explorer anymore. In fact Internet Explorer will not run at all, even if you want. If you want to reinstall the Internet Explorer for some reason, just check the Internet Explorer in the second step.